Top-notch indoor endurance planes look much alike; 30" span entry by Thermal Thumber Andrew Faykun is typical. Fragile microfilm-covered rubber powered jobs present problem to transport. This weighs 5/100-oz. Durable rubber-powered ready-to-go rise-off-ground (ROG) craft is the AJ Hornet. Models not much different flown long before first real plane. Once rudder-only model flying and radio operation are mastered the modeler can progress to R/C systems with more controls. Shortest step up is to the compound escapement or servo motor giving one or two additional controls with some added expense and complication. Elevator control or engine throttle add punch to the variety of flight control possible with even the smaller sport or trainer models. Tops in R/C model flying are the "full-house" systems utilizing multi-channel receivers capable of operating ALL the control functions of the model simultaneously. This is the "most":. 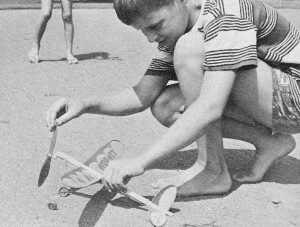 Rudder (with steerable nose or tail wheel), trimmable elevator, ailerons, engine throttle and even wheel brakes give the R/C flyer as complete control of the model as a pilot has over a real aircraft. Such R/C models are large with 6 ft. plus wing spans and .35 to .60 cu. in. engines. Size is necessary to carry the payload of several pounds of radio equipment. Prominent designs are high-wing, low wing and shoulder wing. Uncountable hours of building, tuning, trimming and maintenance go into the flying of this the ultimate in modeling. The flight performance is worth every minute and dollar spent, according to R/C's most enthusiastic super-modelers. A typical flight must be seen to be believed. It can be described thus: After assembling and fueling the model, the flyer starts the engine. Radio is turned on and all control actions are checked off. With engine idling, model is taxied to take-off spot controlled by brakes, rudder and/or wheel. Squared away into the wind, throttle is opened and model starts its take off. Airborne, climb is maintained to a safe altitude. The model is then throttled back and guided through a variety of flat pattern maneuvers such as S-turns. figure eights or rectangles. Adding throttle once again model is climbed higher where loops, rolls, Cuban eights and spins can be done using all flight controls and throttle settings. With throttle retarded model descends and landing approach pattern is begun. Elevator and throttle controls are used to accomplish a real three-point landing. Model is then taxied back to the flyer and stopped with the brakes. He reaches down, cuts engine and turns off radio -- Fantastic! Is it any wonder such model flying has such a tremendous appeal? Radio control flying competition is the apex of all modeling and a very high caliber of performance is exhibited. As the A.M.A. rule book so aptly states: "The criterion is the quality of the performance, not the mechanism of control. R/C competition is based on the excellence of performance of the model's maneuvers, compared to similar maneuvers performed by a futt-slzed plane." 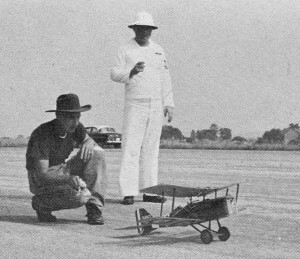 R/C contest flying is divided into three classes: "Rudder-class." 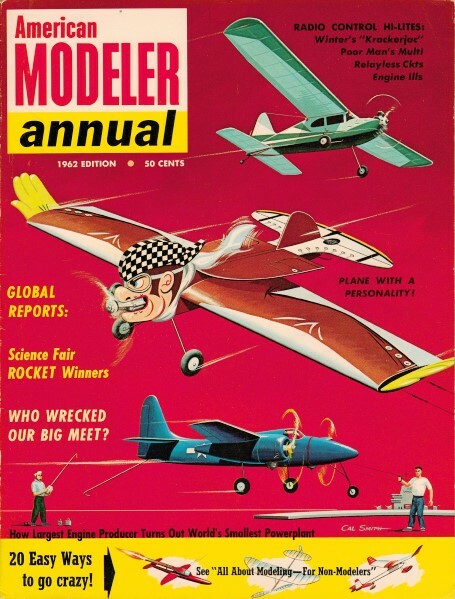 models with rudder-only control; "Multi-class," models with systems allowing independent operation of any and all control surfaces; "Intermediate." models which do not fall into rudder or multi-classes. Model is scored while performing the Pattern event maneuvers. The list is long and includes the flat pattern maneuvers described above and many other stunts done at altitude. Another very interesting phase of R/C contest flying is Pylon Racing. Here flat-out speed around a 1/10 mile long two pylon course is the criterion. 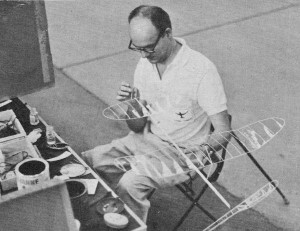 As in other phases of modeling Pylon racing has developed a specialized design type somewhat different from general R/C designers. Models feature long. slender fuselage. thinner than usual airfoils with high and shoulder wings predominating. Engines up to 20 cu. in. sizes are permitted with definite wing area limits for various engine sizes. Speeds have climbed to over 44 mph in pylon racing and similar models fitted with .60 engines have upped straight-away world FAI speed record to 110 plus mph. Third phase of R/C contest flying is Flying Scale already covered in preceding section on Scale. INDOOR - Unquestionably the most unusual. far-out, weird and wonderful phase of all model building and flying is Indoor. This is a separate little model world remote in its extremes from all other types of modeling. First of all there are only three sites in the U.S.A. where major indoor contest flying is conducted. These are the large airship or blimp hangars (docks) at South Weymouth. Mass, Lakehurst, N.J.. and Santa Ana. Calif. In addition to these locations, indoor model flying can also be done in the many large armories, convention halls and auditoriums in other cities throughout the country although the heights of the ceilings limit performance.